Acorn squashes are a variety of winter squashes, whose close cousins are summer squashes such as zucchini and crookneck squash. 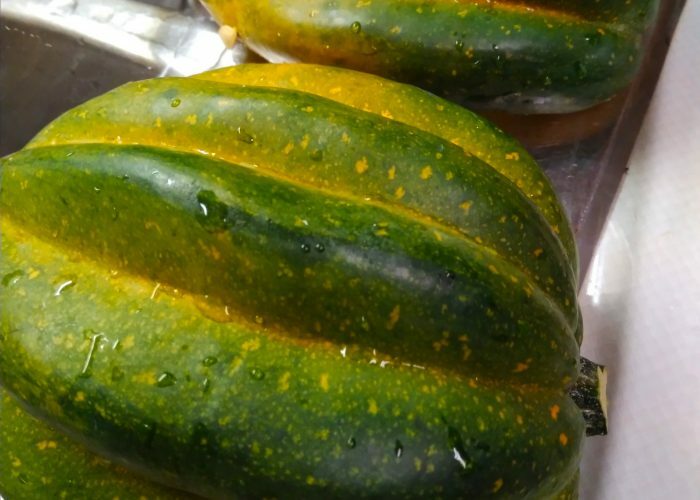 The acorn squash you see at the store are most commonly these vibrant beauties pictured above. They sport a smooth dark green skin with grooved ridges and have bright orange flesh on the inside. What’s extra special about these beauties? They’re gorgeous on the inside too. When compared alongside butternut squash and spaghetti squash, the same serving amount of acorn squash gives you MORE protein, fiber, calcium, iron, magnesium, phosphorus, potassium, thiamin, vitamin B6 and folate than these other two squashes. One cup of roasted acorn squash cubes (205 grams in weight) already provides you with 115 calories, 2.3 grams of protein, 30 grams of carbohydrates, 9 grams of fiber, 90 milligrams of calcium, 1.9 milligrams of iron, 88 milligrams of magnesium, 22 milligrams of vitamin C and a whopping 896 milligrams of potassium! Compare this to the same weighted amount of one cup of baked butternut squash cubes which provides only 82 calories, 21 grams of carbohydrate, 1.8 grams protein, 6.6 grams of fiber, 582 milligrams of potassium, 1.2 milligrams of iron, 31 milligrams of vitamin C, 59 milligrams of magnesium and 84 milligrams of calcium. Acorn squashes are usually baked, but can be microwaved, steamed or sautéed. It can be pureed into soup, or roasted in the oven glazed with some maple syrup. For a savory dish, stuff the acorn halves with brown rice, wild rice, vegetables, beans and nut mixtures. I have even stuffed the acorn squash halves with a delicious citrusy fruity mixture using diced apples and oranges with wonderful results. Some of the spices that work well with acorn squash are garlic, sage, nutmeg and cinnamon. How do you pick the best acorn squash from the lot? If you are going for the green variety and don’t want to cook it immediately, choose one that is as dark green as possible on the outside with a minimum amount of orange splotches. Such chosen acorn squashes can be stored unrefrigerated for at least 2-3 weeks, but when you notice it starting to turn a dusky green and gain more orange on its outer surface, then the acorn squash is starting to become overripe, and you need to use it soon. USDA National Nutrient Database for Standard Reference. http://ndb.nal.usda.gov. Accessed February 21, 2019. Very useful and interesting facts Anna. Thanks for sharing!